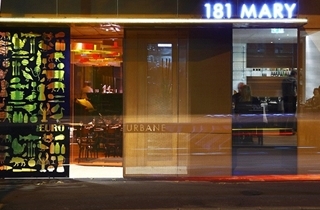 Urbane Restaurant is an icon in the Brisbane dining scene with numerous awards and a substantial reputation. From the outside you will see a screen of bronze expanded mesh designed to give privacy during dining with sneaky glimpses of what lies beyond. The overall philosophy within Urbane is providing the highest quality food and service. There are within The Urbane Group walls, five distinct dining and bar experiences. The entire site has been extended and redeveloped to incorporate Urbane and The Euro, linked spaces, from bar cuisine to creative and diverse fine dining. All of the venues are arranged around a central kitchen hub that has been substantially expanded to provide for the full range of food types from fine dining to bistro, bar cuisine and now an urban garden menu. Each space expresses its own character using materials, light and furniture in an independent creative way. You can glide between the spaces through a series of open and private doors subject to availability. Urbane restaurant is highly regarded and the source of our inspiration is our customers, our travels and our appreciation of our surroundings. Our private dining area, also known to our locals and regulars as Sub-Urbane, is a cellar style dining space situated in the basement of the building. 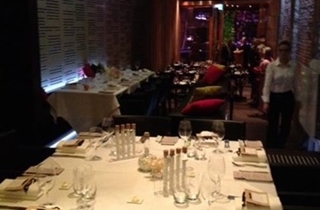 Our private dining room can accommodate up to 32 guests seated and 40 cocktail style. Flanked by 100 year-old stone walls with rough sawn hardwood panels and polished concrete floors, Sub-Urbane is a cellar in the truest sense. To one end, the humidified wine cellar is visible, allowing for customer selection of one of Brisbane’s best restaurant wine collections. Fully wired with the latest AV technology for any type of event, Sub-Urbane is the perfect setting for your intimate wedding. There is also a private rear entrance for discrete use if required.